Hello, June. Summer is here. Well…even though summer officially begins in a few weeks, for many, it has already begun. Favorite vacation spots…here we come! Some folks will head for the beach. Some, for the mountains. And others…for the amusement parks. For me growing up, summer was chock full of sports and frequent trips to Six Flags over Georgia. I was blessed to grow up just a few miles from the park. I remember watching the nightly fireworks from the end of my driveway and being lulled to sleep by the whistle of the train that still circles the park to this day. Much has changed, though. One thing that hasn’t…the thrill of the rides. And while the advancement of technology and imagination has brought all types of rides and attractions to amusement parks across America and around the world, two standards remain: Roller Coasters and Carousels. 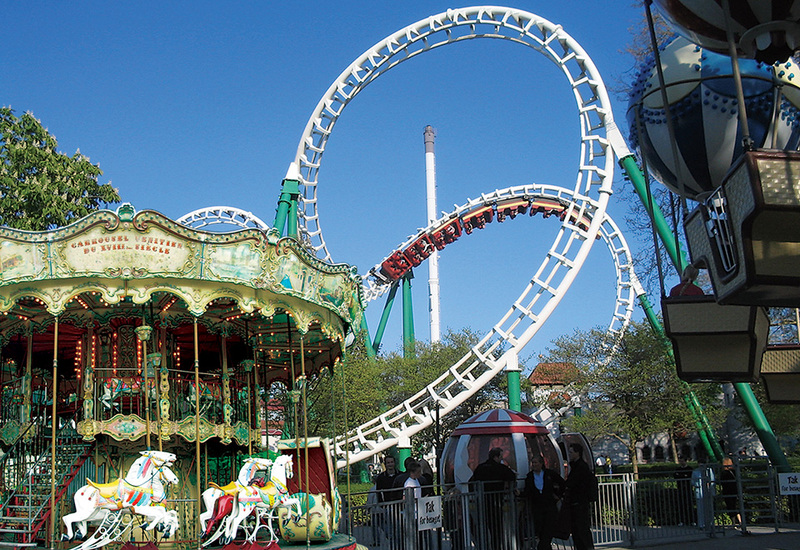 No matter where you go across this great land of ours, see an amusement park, fair, carnival, even some birthday parties, and you will find roller coasters and carousels. Why? Because people of all ages love them, that’s why. Take my family, for instance. My wife loves carousels. I, on the other hand, along with my boys, love roller coasters. Different strokes for different folks. But when we apply the nature of the two rides to the differences in believers’ walk with Christ, their differences, both the rides’ and believers’, couldn’t be more applicable to each other. If you’re a bit confused, it’s okay. It will become very clear…very soon. What’s the first thing that pops into your head when I say, “Roller Coaster?” Perhaps words like: scary, exhilarating, exciting, fast, even dangerous or unsafe come to mind. Now, how about when I say, “Carousel?” Words like: peaceful, slow, safe, even boring are likely to spring forth. When we look at the nature of the two amusement park favorites, one is fast with patches of slow stretches. It’s exciting, has a track filled with twists, turns, bends, loops, high hills, low valleys, provides surprises around every bend, sometimes leaves us breathless, usually leaves us wanting more, and, despite the fear that many feel toward it, brings us safely back to the station…every time. The other is slow, methodical, predictable, safe, never ventures out of its circular path (which is not all that bad as it allows it’s riders to wave at the same people at least 10 times), and except for the random instance someone has difficulty getting either on or off the horse (come on, you can laugh….it’s ok), a ride on a carousel is rather uneventful. Now…if I asked the question: “Which ride and its description more resemble the life of a follower of Christ?”, which would you choose? Before you answer, let me make sure you understand the question. As followers of Christ, we are called to live a life of faith-filled reckless abandonment of our own wills, plans, dreams, logic, security, abilities, control, and future, despite our fear, to the One who knit us in our mother’s womb (Psalm 139:13), who ordained our days before one of them came to be (Psalm 139:16), who hung on a cross and bore the sins of humanity, past-present-future, so that those who believe in him may have eternal life (Romans 4:25; John 3:16), and who said, “For whoever wants to save their life will lose it, but whoever loses their life for me will save it.” (Luke 9:24). I don’t know about you. But I can say with absolute certainty that it would be very difficult to find any person who has answered God’s call, from the beginning of time until now, whose life was more like a ride on a carousel than a roller coaster. So I ask again. Which ride and its description more resemble the life of a follower of Christ? Which ride best describes your life? For those who love carousels, please know that I am not slighting you or making fun of your desire to simulate nailing one foot to the floor and walking a marathon. Sorry. I couldn’t resist. I know not everyone likes roller coasters. But I believe in my heart that if we would truly reflect on the times we stepped out in complete faith, against all logic and rational thinking, against perhaps even the urgings of those who are closest to us, to follow God’s calling, our experience was less like a slow, circular ride on a stationary horse and more like flying up and down hills of steel at break neck speeds, where it was hard to distinguish fear from exhilaration, yet was comforted by a confidence and assurance that the train we were on would remain securely attached to the track…despite the hair pin turns that sparked frequent thoughts to the contrary. That confidence was not in man-made machines. Our confidence…our assurance…was, and is, in God. Until next time…Keep it real…and Armor Up! Make sure to check out Servant Warrior Radio every Friday morning @ 6am CST on KJSL AM 630 TruthTalk630 St Louis, MO and worldwide at www.truthtalk630.com with replays and more information at www.servantwarriorradio.com. The mission of Servant Warrior Ministries is to reach guys, from 5 to 105, where they are to impact and empower them to be who God created and called them to be. For more information go to www.servantwarriorministries.org. The article above appeared in the June 2012 Power Source Magazine, www.powersourcemagazine.com. You can view the actual article HERE.